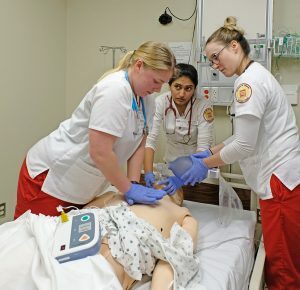 Nursing student Danielle Cimmarusti (left) administered compressions while Kruti Bhakta (center) held their patient’s mask in place and Abigail Albeck squeezes air into his lungs during CPR training in the University of Missouri–St. Louis College of Nursing‘s Learning Resource and Simulation Center (Photo by August Jennewein). The College of Nursing is currently running a campaign to raise funds to support a redesign of the center complete with new technology.